Elon Musk has denied that a tweet about Tesla placed him in contempt of court. 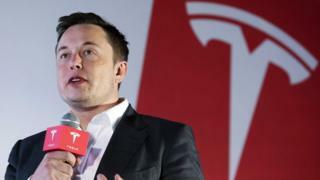 In February, he tweeted about Tesla’s production ambitions, suggesting that in 2019 the carmaker would make 500,000 vehicles. However, he had previously agreed a settlement with the US financial regulator which restricted his use of social media to talk about the firm. This was following tweets about taking Tesla private, which upset investors and which he later retracted. The Securities and Exchange Commission (SEC) had asked the courts to hold him in contempt for violating the settlement following his tweet on 19 February. He later posted a second tweet clarifying that he expected deliveries for the year would be around 400,000 as previously estimated. In court documents Mr Musk’s lawyer argues that “there is no basis to issue contempt sanctions against him”. The tweet in question was “celebratory and forward-looking” the document continues, and was posted after markets had closed. It says that Mr Musk has curtailed the number of tweets he posts both generally and concerning Tesla, and this is proof that he is complying with the order. It also notes that there was no “meaningful” price reaction or a change in the volume of trade of Tesla’s shares following the tweet.